Peyton Derek Hillis (born January 21, 1986) is a former American football fullback who played in the National Football League (NFL). Hillis attended Conway High School in Conway, Arkansas and was a highly touted recruit. 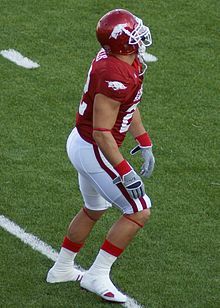 Hillis attended the University of Arkansas in Fayetteville, Arkansas where he was primarily used as a fullback. After being drafted in the 7th round of the 2008 NFL Draft, Hillis rose to the top of the depth chart as the starting fullback for the Denver Broncos. Due to injuries to the running back corps, he became the starting running back. 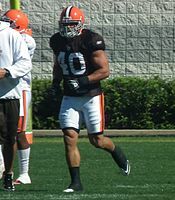 After spending two years in Denver, Hillis was traded to the Cleveland Browns in 2010. In 2011, Hillis won a nationwide vote which put him on the cover of EA Sports' Madden NFL 12 video game. Peyton attended college at the University of Arkansas from 2004–2008, majoring in Sociology. As a true freshman, Hillis gained 240 yards rushing, 97 yards receiving, and scored eight touchdowns, ranking fourth in the SEC in total touchdowns and tying Georgia's Thomas Brown for most touchdowns scored by a SEC freshman that year. Hillis's arrival in Cleveland was met with anticipation after the results of his active stint in Denver during the 2008 season. During the 2010 preseason, the Browns distributed snaps evenly between Hillis, Jerome Harrison, James Davis, Chris Jennings, and Montario Hardesty (upon returning from injury). Hillis' best pre-season rushing game came in Week 2 against the St. Louis Rams when, getting the majority of the snaps, Hillis ran for 51 yards on 12 carries (4.3 ypc). As the regular season began, Hillis' start in Cleveland began much the same way as it did in Denver, listed down the depth chart at both tight end and fullback. Also like his start in Denver, early season injuries to Harrison and Davis thrust Hillis into the starting spot for the Week 3 game versus the Baltimore Ravens. The result was a 144-yard (6.5 ypc) romp against the Ravens' staunch rushing defense, which allowed just 3.4 yards per carry in the 2009 season. Hillis also added 36 yards on 7 receptions for a total of 180 all-purpose yards. The next week, Hillis again ran for over 100 yards at home against the Cincinnati Bengals, leading the Browns to their first victory in the 2010 regular season. A thigh injury in practice limited Hillis in Week 5 against the Atlanta Falcons, though Hillis did add a 19-yard reception for a touchdown, making him the first Browns player since Greg Pruitt to record touchdowns in five consecutive games, though Pruitt's came all through rushing. Coming off a bye week in Week 8, Hillis set career marks in both rushing and all-purpose yards against the New England Patriots in Week 9, finishing the game with 184 rushing yards (6.5 ypc) and 220 yards of total offense. Following this game, Hillis was named AFC Offensive Player of the Week for Week 9, the first Cleveland Browns running back to win that honor since Eric Metcalf in 1992. In week 12, Hillis joined Marshall Faulk as the only players to have achieved more than 130 yards rushing, 3 rushing touchdowns, and 60 yards receiving in a single game. On December 12, 2010, Peyton Hillis went over the 1,000 yard mark on an 8-yard rush, that was preceded by a 25-yard rush. Hillis had a difficult 2011–2012 season that led him to be associated with the Madden Curse, a history of poor performance by athletes after appearing on the Madden cover. The season began with unsuccessful negotiations to extend his contract. He had a good game in a Week 2 match-up with the Indianapolis Colts, running for 94 yards and 2 touchdowns, but he then sat out a game the next week against the Miami Dolphins with strep throat on the advice of his agent. Hillis then injured his hamstring 2 times, once in a game and once in practice, limiting his performance and frustrating teammates. He rebounded towards the end of the season, rushing for 99 yards in Arizona and 112 in Baltimore to finish with 587 and 3 touchdowns. At the end of the year, Hillis stated he wanted to re-sign with the Browns, even willing to offer a hometown discount, but the Browns never made him an offer and allowed him to leave as a free agent to Kansas City. On March 14, 2012, Hillis signed with the Kansas City Chiefs. He finished the 2012 season with 309 yards on 85 carries as a backup to Jamaal Charles. On July 23, 2013, Hillis signed with the Tampa Bay Buccaneers. It was announced on September 21, 2013 that Hillis had been released by the Buccaneers. His Buccaneers career ended with one game active, no carries, no catches, and no offensive yards. On October 16, 2013, the New York Giants announced they had signed Hillis for the 2013-2014 season. On March 11, 2014, the Giants gave Hillis a $1.8 million contract extension for two more years. Before the start of the 2014 season, Hillis agreed to change his number from #44 to #33, so that rookie Andre Williams could wear the number he wore in college. Hillis wore 33 while he was in training camp with the Buccaneers. Hillis married his wife Amanda in October 2011. Their first son, Orry, was born in June 2013. They live on their 1300-acre soybean farm in southwestern Tennessee. ^ "Madden '13 Cover: Vote for EA Sports' Madden NFL 2013 Cover Athlete - SportsNation - ESPN". Espn.go.com. Retrieved September 22, 2012. ^ Schwab, Frank (July 23, 2013). "Peyton Hillis (remember him?) has signed one-year with Tampa Bay Buccaneers". Yahoo! Sports. Retrieved July 23, 2013. ^ La Canfora, Jason (September 21, 2013). "Peyton Hillis released by Tampa Bay Buccaneers". Jason La Canfora. Retrieved September 21, 2013. ^ Hanzus, Dan (March 11, 2014). "Report: Peyton Hillis signs New York Giants contract". NFL.com. Retrieved May 4, 2014. ^ "Giants release RB Peyton Hillis". ESPN. Retrieved February 25, 2015. ^ "New York Giants release RB Peyton Hillis". NFL. Retrieved February 25, 2015. ^ Brad Gagnon. "The Peyton Hillis Story: From Madden Cover to Outside Looking In". Bleacher Report. Retrieved August 28, 2015. ^ Pennington, Bill (October 26, 2013). "Giants' Hillis Goes From Watching 'Monday Night Football' to Playing in It". The New York Times.